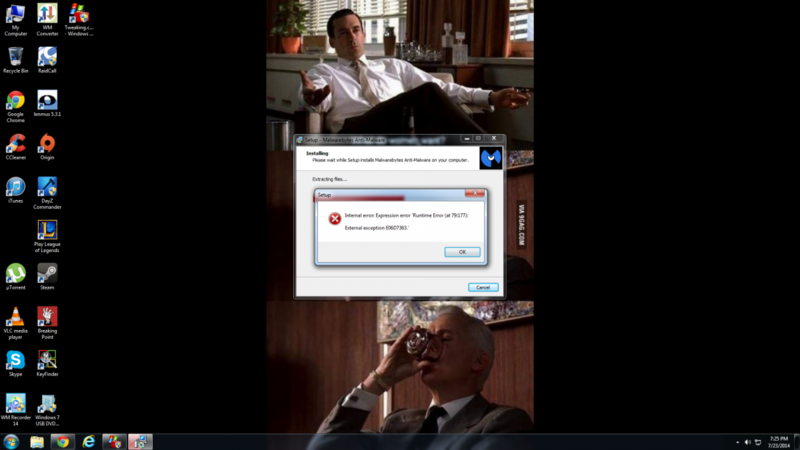 Ok so this is a series of bad stuff happening to my PC. (D-Link Wireless AC dual band DWA-171). From then on it would not install properly. The program would freeze at different points during installation, so I attempted to reboot my PC. Bumping into the adapter and this issue happening may be coincidental but it is also possible that something like important Windows installation was interrupted when the adapter was banged. Are you able to try the USB adapter on another computer to see if it still functions correctly. 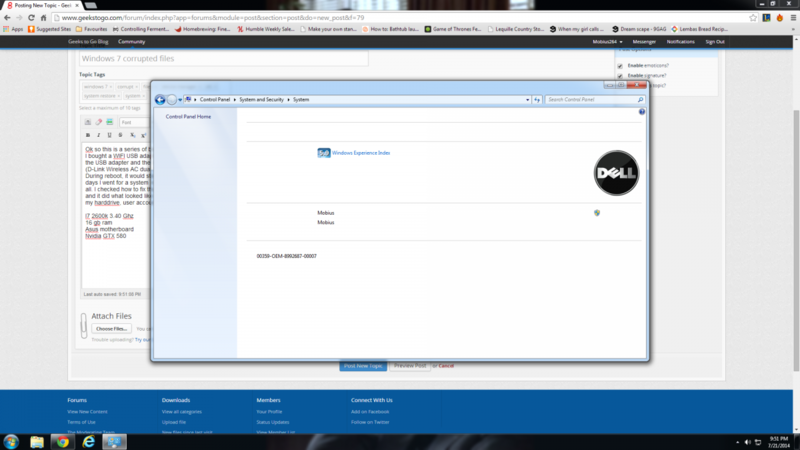 Do you have a Windows 7 or Dell installation disk. Before you start System Restore, save any open files and close all programs. System Restore will restart your PC. Open System Restore by clicking the Start button . In the search box, type System Restore, and then, in the list of results, click System Restore. If you're prompted for an administrator password or confirmation, type the password or provide confirmation. Follow the steps in the wizard to choose a restore point and restore your computer. For more information, see System Restore: frequently asked questions. Your in good hands with phillpower! I don't like this statement in your post! HD's don't like hard reboots; if your talking about using the power button to shut down and power up.The newer HD's can handle hard reboots, but your operating system can't. Just guessing, but you may have corrupted your OS. Phill can help you try to fix that. I had my brother try to install the WIFI program and he had the same problem, froze while installing. For the system restore, I found a point I believe is when I first tried to uninstall the WIFI program, but when I tried it I got an error screen, which I screen shot and attached. I do not have a Windows installation disc but I do have a recovery disc. I bought this PC used from someone who had it custom built. He gave me the recovery disc but I am not sure if it matches the OS he put on the PC. I found out the hard way that they have to match, as I tried to use the disc to fix up my old laptop and it made the OS it had not genuine. Not sure if there is a way to match them up before trying to use the disc or not. What froze, the installation of the software or the wireless device, was the device connected. If you do not have the product key for the present OS written down and stored safely, download Magical Jelly Bean (free) key finder from here, make a note of the code, store it somewhere safe and reveal it to nobody. Post back when you have the ISO. Right before the program begins the install, it asks the user to insert the USB adapter. It freezes right before the loading bar is finished installing the program. The problem could then be with the adapter as in the installation software cannot detect the device because it is damaged, we can come back to this if you like. Download and then run steps 2, 3 and 4 of the Windows Repair (All In One) which you can get from here please ensure that you do create the new restore point that will be suggested. Ok so I already had Malwarebytes but it did not open. I tried to reinstall but I got a bunch of the same runtime errors during the installation (posted picture). As well my steam program will not open, it shows an update window quickly and then nothing happens. Those are the only two programs I've seen so far that wont work, next to D-Link. I have avira antivirus which is still working if that would work for a system scan? Edited by Mobius264, 23 July 2014 - 04:32 PM. Hello! Phill may be busy for awhile! Have you done any of the things that Phil suggested in posts 5 and 7??? I think one suggestion involves repairing your OS??? While waiting for Phill run a sfc /scannow! Open Command Prompt , type the following command and then press Enter. That's one of the issues I first posted. The sfc in command prompt doesn't do anything. The program he had me download does a sfc sweep but it asks you to use malwarebytes to do a virus/malware scan first, but the program doesn't work, so I was wondering if Avira Antivirus will work as a substitute? I have everything else he said to do ready to go. Phill lives in the UK and is bed. He has been really busy with his job lately and I have been trying to help on the topics he's helping on. I don't like to get ahead of Phill. It sounds like you have several issues with your PC.. 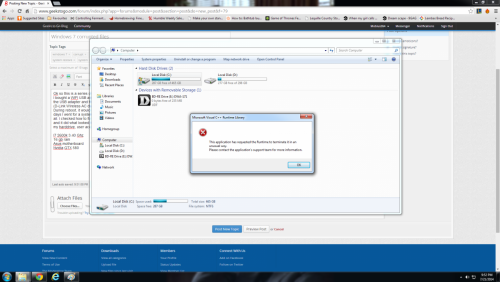 I'm not understanding why malwarebytes doesn't work. Antivirus programs are different than malware software and are usually run with programs like malwarebytes. Yes you can run Avira. 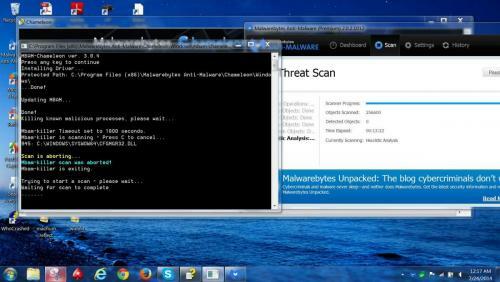 You might try Malwarebytes Chameleon first. Edited by donetao, 23 July 2014 - 10:09 PM. 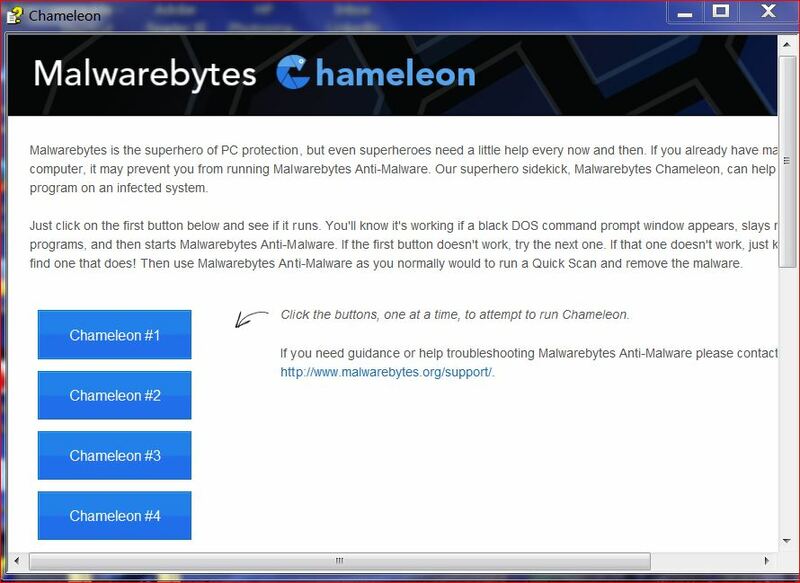 You have 13 chances to find and run malwarebytes chameleon. I'll be up another 30 minutes and then Phill can take over! Will be monitoring your topic and helping when I can. It's my bed time. Phill can take over from here! I just ran Malwarebytes Chameleon. I cancelled the MBAM killer because I knew my PC was clean and would complete the scan; and allowed MBAM to complete the scan. No malware was found, but I knew that would happen, because my PC is clean. I keep it that way!! I would never own a computer without Macrium Reflect and MBAM Pro. I have attached two screen shots and hope they help. I will monitor your topic and help when I think I can. I think Phill and I make a great team. What do you think?? Edited by donetao, 23 July 2014 - 11:35 PM. I can wait as long as it takes for you guys to reply, I am happy just to have help at all. Chameleon did not detect anything and it could not open MBAM. 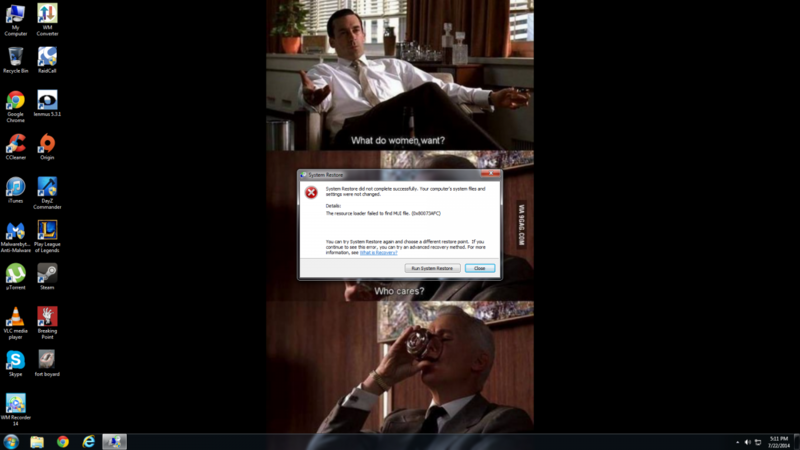 I am guessing it has to do with Windows being corrupted. I am going away for 4 days, so I'll check back here as soon as I am back. Thanks for all the help so far. You are very welcome! I'm sure Phill will be able to help you will your problem.